Iranian proxies launch missiles at a Saudi tanker, threaten to bomb Arab-coalition ports. On Wednesday last week, Iran’s proxy army in Yemen did something which must be regarded as a serious escalation of the now four-year-old war in the devastated country and which could trigger a much larger conflict involving the United States and Iran. The Iranian-backed Ansar Allah militia (Houthis) attacked two oil-laden super tankers belonging to Saudi Arabia in the strategically important waterway Bab al-Mandeb, with Iranian C-801 or C-802 land-to-ship missiles hitting only one of the vessels near the waterline. A statement by state-owned oil company Aramco made clear that the two super tankers carried two million barrels of oil each and that the hit caused only “minimal damage,” while no oil was spilled in the sea. The brazen attack led to a halt of Saudi oil shipments through the twenty-kilometer-wide shipping lane where an estimated 4.8 million barrels of oil pass daily. The announcement immediately led to a rise of oil prices on global markets with some media predicting further disruption of oil shipments via the Bab al-Mandeb strait or the Strait of Hormuz, as Iran has recently threatened to do. This could spike oil prices “to catastrophic levels”. “If the quantity supplied to the market is cut by 10%, the price of oil will increase by 250%,” according to Forbes. The missile attacks on the two Saudi super tankers led to speculation Iran had ordered Ansar Allah to launch the missiles with the purpose of creating global oil instability after The United States decided to re-impose sanctions on Iran as part of an effort to bring down the regime of Ayatollah Ali Khamenei. Also on Wednesday, the Ansar Allah militia reportedly launched a missile at the French-built Saudi frigate al-Damman off Yemen’s western coast causing no damage or casualties. The missile launch marked the eighth time Ansar Alah attacked warships and other vessels belonging to the United Arab Emirates (UAE), Saudi Arabia and the United States since October 2016. The Shiite Yemenite militia receives its weapons and training from the Iranian Revolutionary Guards Corps and members of Hezbollah in Lebanon. It has launched numerous ballistic missiles at targets in Saudi Arabia since the Kingdom formed a coalition to counter the growing Iranian threat and intervened in the civil war in Yemen. During a ceremony in honor of fallen IRGC members the commander of the Quds Force furthermore said the Trump Administration was making a “big blunder” by underestimating Iran’s power and potential in the Middle East and beyond. He accused the U.S. of gathering “hypocrites” and “anti revolutionaries”, a hint at the current efforts by the Trump Administration to form a mainly Sunni Arab coalition dubbed “Arab NATO” that would help the U.S. and Israel in confronting Iran. Soleimani’s remarks came ahead of a Maariv report indicating that the Trump Administration is now considering the use of military force against the Islamic Republic after it has become apparent that Iran is trying to choke off oil supply to the West. Australia and the United Kingdom are reportedly part of the new formed anti-Iranian coalition, according to ABC News in the U.S.. 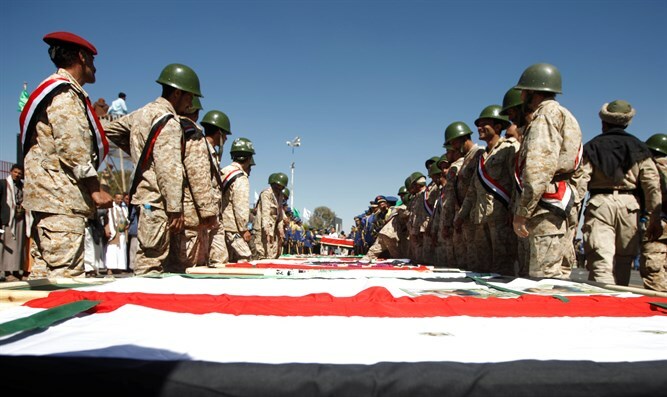 The need to undertake military action against Iran’s Yemenite proxy army has become urgent, not only because of the threat to the West’s oil supply but also because Ansar Allah is threatening to attack capitals and ports of the members of the Arab NATO. "Our missiles are able to target the ports of other member states of the aggressive Saudi-led coalition,” Mohammad Ali al-Houthi, head of the Supreme Committee of Yemen Revolution and the leader of Ansar Allah, told al-Jazeera, Thursday. The Yemenite militia reportedly also attacked the international airport of Abu Dhabi last week, according to its TV station Al-Masirah. Ansar Allah used a drone to attack the airport of the Gulf state, but failed to disrupt operations there. Saudi Arabia, meanwhile, accused the UN Security Council of inaction in light of the escalating Ansar Allah attacks against the Kingdom and other Gulf states and Iran's belligerent activities in the Gulf region. "Saudi Arabia notes with regret the Security Council’s inaction …. which has allowed Iran to arm the terrorist Houthi militias with several ballistic missiles, drones and sea mines,” Abdallah al-Mouallimi, Saudi ambassador to the UN, wrote in a letter to UN Secretary General Antonio Guterres.